Earlier in this book, I talked about conductors and insulators. Conductors are so called because they're very conducive to the passage of electricity. Copper, silver, and gold are the best conductors, and it's no coincidence that all three are found in the same column of the periodic table of the elements. As you'll recall, the electrons in an atom are distributed in shells that surround the nucleus of the atom. What characterizes these three conductors is a lone electron in the outermost shell. This electron can be easily dislodged from the rest of the atom and hence is free to move as electrical current. The opposites of conductors are insulators—like rubber and plastic—that barely conduct electricity at all. The elements germanium and silicon (as well as some compounds) are called semiconductors, not because they conduct half as well as conductors, but because their conductance can be manipulated in various ways. Semiconductors have four electrons in the outermost shell, which is half the maximum number the outer shell can have. In a pure semiconductor, the atoms form very stable bonds with each other and have a crystalline structure similar to the diamond. Such semiconductors aren't good conductors. But semiconductors can be doped, which means that they're combined with certain impurities. One type of impurity adds extra electrons to those needed for the bond between the atoms. These are called N-type semiconductors (N for negative). Another type of impurity results in a P-type semiconductor. Semiconductors can be made into amplifiers by sandwiching a P-type semiconductor between two N-type semiconductors. 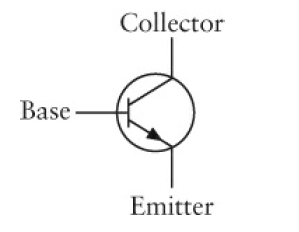 This is known as an NPN transistor, and the three pieces are known as the collector, the base, and the emitter.